What is The Stolen Pony Lounge? A mobile lounge/event space inside a 31ft 1974 Airstream Trailer that is towed into place. We are currently based out of the Los Angeles area and can travel anywhere for an additional fee. Contact us for a quote! DOES THE STOLEN PONY LOUNGE HAVE A BATHROOM? No, the Airstream does not have a bathroom. How do I reserve the Stolen Pony Lounge for my event? Easy- just use our contact form and we’’ll check to make sure your date’s available. After that, we’ll e-mail you a Rental Agreement. A signed Rental Agreement and non refundable 50% security deposit must be received to reserve your date(s) with the remaining balance due ten (10) days before your event. We also require a Damage Deposit in case of any damage caused to the trailer during the event. The Airstream is 31ft long, 7ft 11in Wide, 9ft 5in Height. Can I rent the Airstream overnight? Maybe. We are not interested in the trailer rocking and us a knocking, but are open to certain scnenarios. What are the electrical requirements for the Stolen Pony Lounge? The Stolen Pony Lounge needs to be within 30ft of one (1) standard household 110 volt electrical outlet to run basic outlets. A 30 amp minimum power source of 3500 watts are needed to run AC. We can provide a generator for an additional fee. We will need to know from you at least 2 weeks before your event if you need us to rent a generator, this option is an add on to your package. 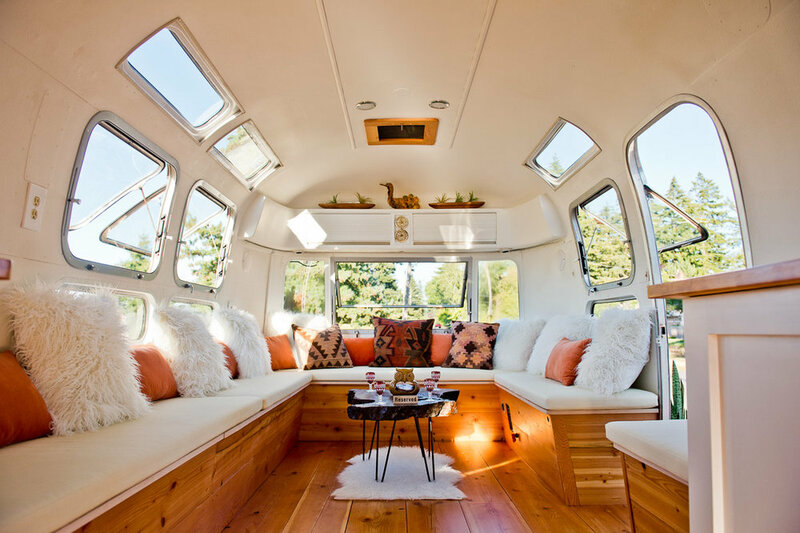 Where can I look and tour the Airstream before booking? Please contact us so we can arrange a tour. Do your packages include alcohol, setups, glassware or food? Stolen Pony Lounge does not carry a state liquor license or food prep license; therefore, all alcohol, setups, glassware and food items must be provided by client or contracted catering company. Can I ride inside the Airstream while it's being towed? Unfortunately riding in the back of a travel trailer is illegal.